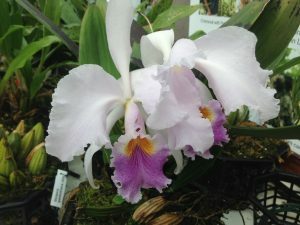 This large flowered Cattleya species is native to Colombia and Venezuela where it grows from 700m-1000m altitude making it a little cooler growing than some of its close relatives. We find it enjoys our Warm Americas section (min 15C) where we grow it in a basket of open compost. The large fragrant flowers of the species typically have light pink petal and sepal apart from the yellow and purple on the lip. It flowers for us very regularly in early summer just before sending out the new growth.